Al Mar Quest III mint with the great original sheath. Al Mar Quest III is mint with the great original sheath. The blade is 10" and it is 15-1/4" overall. It hasn't been carried, used or sharpened. Serial number #194/200 and Model 4011C. The handle is black neoprene and the double edge blade is 6A stainless steel and 3/16" thick. It has two sharpened edges as it came from the factory. This is a big Al Mar --- 15-1/4" OAL! It comes with the original fine nylon sheath made by Eagle Industries of Fenton Missouri or by Pinnacle, Inc. of Vancouver, Washington. The sheath is black nylon, has a pocket on the front and several different hold downs on the back. It can be used vertically or horizontally. It has lanyards to tie to your leg or to be strapped down on just about any rig. 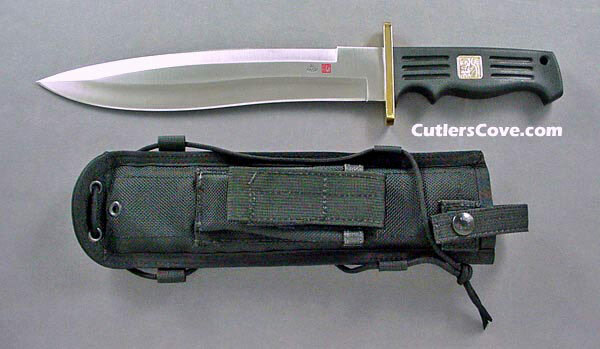 The sheath can be attached to almost anything and anyway you like to carry the big knife. It is well thought out.